We are a leading Manufacturer of ribbon blender mixer from Delhi, India. Ribbon Blender (also named ribbon mixer) is a basic industrial mixing machine. They consist, basically, of a trough-shaped shell (usually 2 to 3 times longer than it is wide) with a semicircular bottom, fitted with a horizontal longitudinal shaft on which are mounted arms supporting a combination of ribbon blades, paddles or helical screws set at a fairly close clearance to the semicircular mixer body so that no layer of material remains on the bottom of the ribbon mixer. The most effective design of ribbon layout is the double spiral in which the outer ribbon moves the product in one direction and the inner ribbon moves it in the opposite direction.The ribbons rotate and move materials both radially and laterally to insure thorough blends in short cycle times. 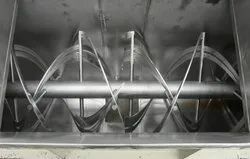 Ribbon agitators are used for blends that will be between 40 and 70% of the rated capacity of ribbon blender.